There has been much written in recent months about toxic garden plants. The ones that kill dogs, cats and children, seemingly willy-nilly. At the end of last year there was the tragic tale of a gardener who lost his life after coming into contact with aconites. Admiring this beautiful flower earlier in the week I was reminded of this young man and wondered what he would have thought of the ensuing witch hunt. At the time, and indeed since, the media have recounted many tales of horticultural horrors and demons. Another big bad bogie man (or woman) just waiting to harm us. To many in the gardening community reports that merely “brushing past” could result in death were held with some skepticism. Incidents of poisoning are few and far between in our profession, unlike accidents involving ladders, lawn mowers and (eyes squeezed tight) chainsaws. The world is a dangerous place, so we must teach our children not to walk in front of cars, not to put their hand in the flame, not to jump in the deep end if they can’t swim. We must also teach them not to eat plants unless they have been told it is safe to do so. Mistakes inevitably happen, with sometimes catastrophic consequences, and I am sure this unfortunate event made us a little bit more careful, for a while anyway. It is terribly sad that this son, husband and father’s life was cut short but I am sure, as a gardener, he would not have wanted his poignant story to make a pariah of these wonderful flowers. So do not lock up your daughters (and sons) safe from the dangers lurking outside, let them out into the wicked world and have some fun! Thank you Anne, I do wonder sometimes …. I was puzzled by this story too as many of us grow these beautiful plant quite safely.. All plants need to be treated with respect though. At the moment I am on antibiotics for a badly infected leg from goodness knows what cut, prick, bite or sting from the garden. Like all gardeners, I hardly notice when plants attack me, I always have cuts and abrasions. I shall be a bit more careful in future. Yes, we should be careful and toxic plants should perhaps be better labelled. Animals tend to know better already. Poisonous plants are about the only ones around here that don’t get eaten. I need more. I grew aconitums for years before I discovered they were potentially poisonous. I don’t like to wear gardening gloves unless I am doing a really tough or mucky job, so I am always very careful to wash my hands when I come indoors. I think it’s just common sense to be a bit careful around plants, especially if you don’t know them. Sadly tragic accidents do happen – a reminder to us all to take care. There are so many poisonous things in the garden. I always used to say at Cliffe that we could kill a small city with the stuff we grew – rininus, digitalis, cestrum parquii and aconites to name a few. To my knowledge the present score is 0! I used to have a morbid fascination with my parents’ laburnum tree – I was convinced the cat was going to chew the seed pods and meet a nasty end. In the end she lived to the ripe old age of 21!! Of course, Laburnum is another one. I keep thinking of new ones – brugmansia was another I remembered. 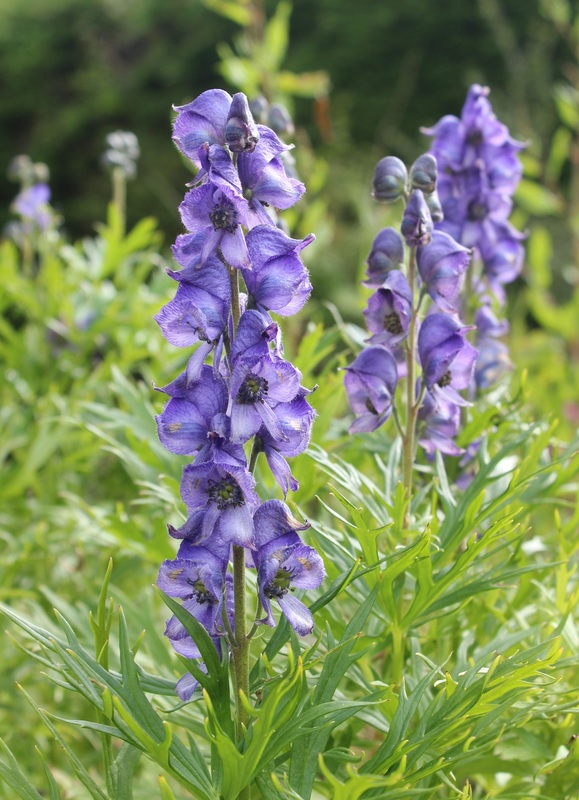 I wouldn’t have Aconitum in my garden if I still had little children about, but it is a beautiful plant and I do grow it. I once saw it in a florist’s bouquet, to lovely effect, but I really wondered about that. Perhaps florists wear gloves as a matter of course when they are handling flowers? It’s very tragic and sad when plant – induced accidents happen, but they are extremely rare. Equally sad are the stories and bad publicity that follows, sometimes based on ‘fiction’ facts. I handled Aconitum many times with bare hands and apparently I am still here, not to mention it was a cultivated plant since gardens came into being. It is a problem to be resolved through education not through inducing fear of ‘villain’ plants and the unknown. Quite true, we live in a very “scared” world, for many reasons. It is such a shame that the very things that can make it a nicer place to live are now something else to worry about.